For other people named William Wheeler, see William Wheeler (disambiguation). 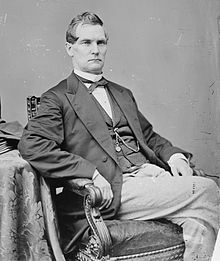 William Almon Wheeler (June 30, 1819 – June 4, 1887) was an American politician and attorney. 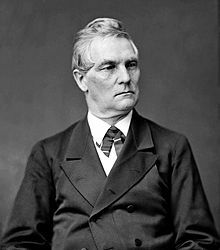 He served as a United States representative from New York from 1861 to 1863 and 1869 to 1877, and the 19th vice president of the United States from 1877 to 1881. Born in Malone, New York, Wheeler pursued a legal career after attending the University of Vermont. After serving in various local positions, he won election to the New York State Legislature. He served in Congress from 1861 to 1863 and from 1869 to 1877. He was widely respected for his integrity, and refused his salary increase after Congress passed an 1873 pay raise that he opposed. After the 1876 Republican National Convention settled on Rutherford B. Hayes as the party's presidential nominee after seven ballots, the delegates nominated Wheeler for vice president. Nominated by Congressman Luke P. Poland, Wheeler surged into an early lead over Frederick T. Frelinghuysen, Marshall Jewell, and Stewart L. Woodford to clinch the nomination on the first ballot. Wheeler was nominated because he was popular among his colleagues, having worked to avoid making enemies in Congress. In addition, as a resident of the populous Eastern state of New York, he provided geographical balance to the ticket, since Hayes was from the populous Midwest state of Ohio. The Republican ticket prevailed in the contentious 1876 presidential election, though they lost the popular vote. 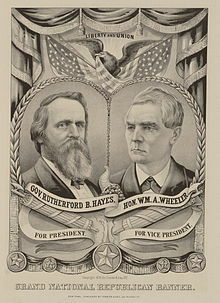 Though they had not known each other before the convention, Wheeler and Hayes got along amicably while in office. They chose not to seek second terms, and Wheeler returned to Malone after the end of his term. He died in Malone in 1887, and was buried at Morningside Cemetery in Malone. 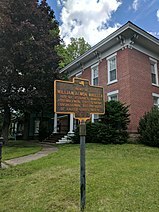 William Almon Wheeler was born in Malone, New York, and attended Franklin Academy and the University of Vermont, although monetary concerns forced him to drop out without graduating. (Wheeler received the honorary degrees of master of arts from Dartmouth College in 1865 and LL.D. from the University of Vermont (1867) and Union College (1877). In 1876 he received his bachelor of arts degree from the University of Vermont "as in course", making him a graduate of the class of 1842. He studied law with Asa Hascall, a Malone attorney and politician who served as town supervisor, justice of the peace, district attorney, and member of the New York State Assembly. Wheeler was admitted to the bar in 1845, and practiced in Malone. He was District Attorney of Franklin County from 1846 to 1849. He was a member of the Assembly (Franklin Co.) in 1850 and 1851; and of the New York State Senate (17th D.) in 1858 and 1859. He was elected as a Republican to the 37th United States Congress, holding office from March 4, 1861, to March 3, 1863. He was elected to the 41st, 42nd, 43rd and 44th United States Congresses, holding office from March 4, 1869, to March 3, 1877. During his House tenure, Wheeler served as chairman of the Committee on Pacific Railroads (42nd Congress) and the Committee on Commerce (43rd Congress). Wheeler's reputation for honesty was celebrated by Allan Nevins in his introduction to John F. Kennedy's Profiles in Courage. Roscoe Conkling, a Senator and a political boss once offered, "Wheeler, if you will act with us, there is nothing in the gift of the State of New York to which you may not reasonably aspire." Wheeler declined with "Mr. Conkling, there is nothing in the gift of the State of New York which will compensate me for the forfeiture of my self-respect." When Congress voted a pay raise in 1873 and made it retroactive for five years (the Salary Grab Act), Wheeler not only voted against the raise, but after it passed he returned his salary increase to the Treasury department. "[W]e owe it to the cause of universal civil liberty, we owe it to the struggling liberalism of the old world,...that every man within [New York], of whatever race or color, or however poor, helpless, or lowly he may be, in virtue of his manhood, is entitled to the full employment of every right appertaining to the most exalted citizenship." Wheeler was a delegate to the 1876 Republican National Convention, which had nominated Rutherford B. Hayes for President on the seventh ballot. Wheeler was considered a "safe" choice for the vice presidential nomination, as he had not made many enemies over the course of his political career, though Roscoe Conkling himself supported the former congressman from New York Stewart L. Woodford. When the time came for the convention to nominate a vice-presidential candidate, congressman Luke P. Poland of Vermont nominated Wheeler, who immediately surged to the lead over Woodford and several other candidates. By the time the roll call reached New York, the result was apparent, and Woodford withdrew, enabling New York to cast all its votes for Wheeler. Wheeler won the nomination with 366 votes to the 89 for his nearest rival Frederick T. Frelinghuysen, who later served on the Electoral Commission which decided the 1876 election in favor of Hayes and Wheeler. Governor Hayes, when he heard of Wheeler's nomination, wrote to his wife Lucy: "I am ashamed to say: Who is Wheeler?" Hayes and Wheeler had not served in the House of Representatives at the same time, so Hayes was unfamiliar with his running mate. He was inaugurated in March 4, 1877 and served until March 4, 1881. Since Wheeler was a recent widower, his wife having died one year before he took office, he was a frequent guest at the White House's alcohol-free luncheons. As Vice President, Wheeler presided over the Senate. According to Hayes, Wheeler "was one of the few Vice Presidents who were on cordial terms, intimate and friendly, with the President. Our family were heartily fond of him." Hayes had announced at the start of his administration that he would not run for a second term. Wheeler did not run for the 1880 Republican presidential nomination, and retired at the end of his term. In January 1881, Wheeler received 10 votes in the New York State Legislature's Republican caucus to determine a nominee for the U.S. Senate seat held by Democrat Francis Kernan. The Republican nomination went to Thomas C. Platt, who received 54 caucus votes; the Republicans controlled the legislature, and Platt defeated Kernan 104 votes to 50. He retired to Malone in March 1881 when his term as vice president was over. In May 1881, Platt and Roscoe Conkling resigned their U.S. Senate seats in a dispute with President James A. Garfield over control of patronage in New York, triggering two special elections. In the legislative election for Platt's seat, it took six weeks of balloting to elect a candidate; Wheeler's name was in consideration, and he received as many as 23 votes before Warner Miller was elected with 76 votes on the 46th ballot. Wheeler was also a candidate for Conkling's seat; the voting went on for several weeks, and he received as many as 50 votes in earlier ballots before Elbridge G. Lapham won with 92 votes on the 56th ballot. Wheeler died at his home in Malone, New York at 10:10 A.M on Friday, June 4, 1887, 26 days before his 68th birthday. The funeral was held at the Congregational church in Malone. He was interred next to his wife in Malone's Morningside Cemetery on June 7, 1887. ^ a b c d Tally, Steve (1992). Bland Ambition: From Adams to Quayle-The Cranks, Criminals, Tax Cheats, and Golfers Who Made It to Vice President. New York: HBJ. pp. 152–157. ISBN 0156131404. ^ Murphy, William D. (1858). Biographical Sketches of the State Officers and Members of the Legislature of the State of New York in 1858. Albany, NY: J. Munsell. p. 110. ^ John F. Kennedy, Profiles in Courage (New York, 1956), p. xiv. ^ Purcell, L. Edward (2010). Vice Presidents: A Biographical Dictionary. York, PA: Maple Press. pp. 183–184. ISBN 978-0-8160-7707-6. ^ Trefousse, Hans L. (2002). The American Presidents Series: Rutherford B. Hayes; The 19th President. New York, NY: Henry Holt and Company. p. 68. ISBN 978-0-8050-6908-2. ^ "William A. Wheeler Dead. The Ex-vice President Passes Quietly Away. An End Which Brought Relief From Great Suffering" (PDF). New York Times. June 5, 1887. ^ "At Rest With His Kindred. Ex-vice-president Wheeler's Funeral At Malone, N.Y." (PDF). New York Times. June 8, 1887. Wikimedia Commons has media related to William Wheeler. Wikisource has the text of a 1905 New International Encyclopedia article about William A. Wheeler. United States Congress. "William A. Wheeler (id: W000341)". Biographical Directory of the United States Congress.